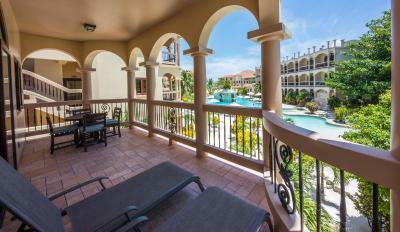 Lock in a great price for Coco Beach Resort – rated 8.9 by recent guests! The staff was very nice and accommodating. We stayed in one of the Casitas with a full kitchen, which was well supplied with cooking items. Beautiful pools with swim up bar was nice. Food was good and reasonably price. They also offer free use of bikes, kayaks and standup paddleboards. The rooms were spacious and comfortable and the staff was extremely helpful and friendly! My kids loved the hammocks! We were treated so well by the staff, from the moment we landed in Belize city their focal made sure we were on the next flight out to san pedro. Impressive service beyond our expectations. Thank you. The hotel is beautiful. Very clean, great rooms and close to town. The staff was amazing. Everything was seemless from the minute I landed in Belize City until checkout, the staff made sure everything ran smoothly. They were willing to accommodate our requests and were there to help when needed. I loved having the golf cart rentals onsite, free bike rentals and the free water bottles in the room. Accommodations were very nice. Service was excellent. Restaurant/bar/cafe had a wide selection of food. Food was very good. Pool was warm and clean. Spacious rooms and comfortable beds. Ocean reef (or pool) view from the porch. Super clean. Would definitely stay at Coco Beach again! I traveled with my two daughter's (24, 27) and we were welcomed and taken care of so warmly! We rented a golf cart and even the guards at the gate told us to have a good time and were happy to see us come back safely. The concierges, Gabrielle and Vanessa were incredibly helpful and genuinely looked after us with our snorkeling trips and suggestions into town for dinner. The young men at the pool bar and restaurant were funny and kind. The girls had fantastic conversations with Ashton that went beyond excellent service. The girls felt like they were making friends and found out so much about Belizean life. As somebody who has been in customer service for 35 years........That's skill :) Very happy with our experience! The unit A4 was well maintained and comfortable. The view from the balcony was perfect. It had everything you needed for a comfortable stay. I enjoyed being just north of town, only a golf cart ride away if you wanted to go into town. The pool was large and never seemed crowded. The beach area was beautiful. 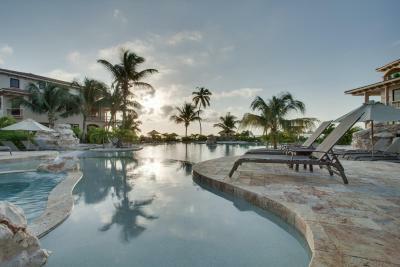 The pool is by far the best on the island and the deluxe hotel rooms are spacious. 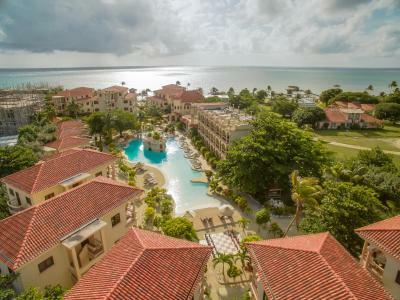 Coco Beach Resort This rating is a reflection of how the property compares to the industry standard when it comes to price, facilities and services available. It's based on a self-evaluation by the property. Use this rating to help choose your stay! 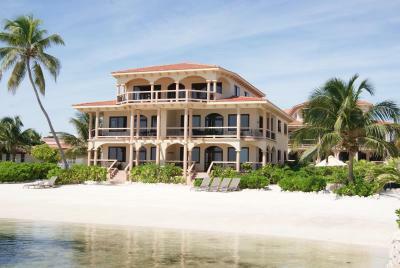 One of our top picks in San Pedro.This property is located on the coast of Ambergis Caye and offers guests 2 outdoor swimming pools, on-site restaurants and sports facilities. Each air-conditioned villa and suite at this luxurious resort comes with a spacious dining and living area, as well as a flat-screen TV, free toiletries and sea and pool views. Wi-Fi is available throughout the property. 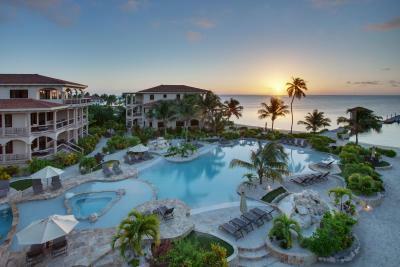 The resort’s Cocoblanca restaurant serves international food and Caribbean dishes and it is open for lunch and dinner. The Coco Café is open from 7:00 to 15:00 and serves pastries and breakfast snacks. Guests at Coco Beach Resort enjoy use of kayaks, bicycles and paddle boats for a fee, while Mexico Rocks snorkeling site is only 3.7 mi from the property. San Pedro Airport is 1,800 feet from the property. This property is also rated for the best value in San Pedro! Guests are getting more for their money when compared to other properties in this city. 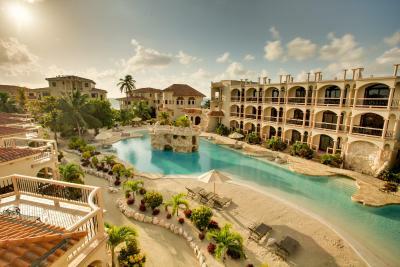 When would you like to stay at Coco Beach Resort? 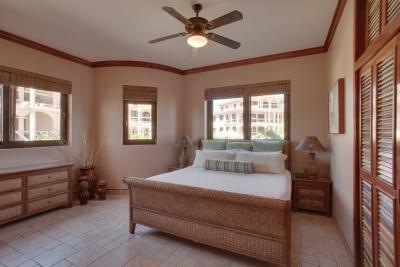 This air-conditioned room includes a flat-screen TV, a sitting area and a private outdoor balcony with pool views. Guests also enjoy free toiletries and Wi-Fi throughout. 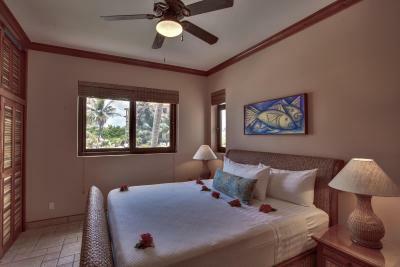 This spacious, air-conditioned suite features a terrace with sea views, as well as a comfortable sitting and dining area. 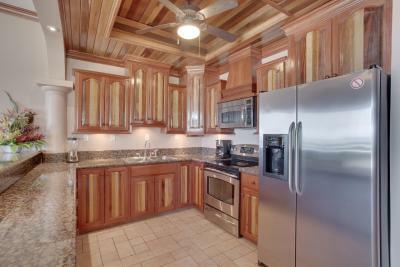 Guests can also find a full kitchen and a flat-screen TV with cable channels. The bathroom has free toiletries, and Wi-Fi is available throughout. 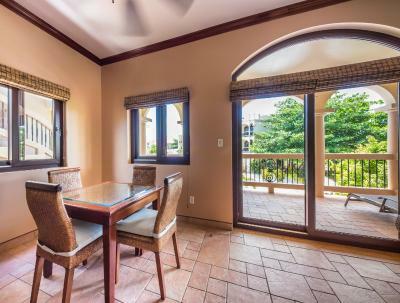 This large villa features high vaulted ceilings, as well as a large and comfortable sitting and dining area. It has a full kitchen, private terrace and a flat-screen TV. The bathrooms include free toiletries. This apartment features 2 king bedrooms, a private terrace and a comfortable sitting and dining area. The kitchen is fully equipped, and the private bathroom has free toiletries. Wi-Fi is available throughout. 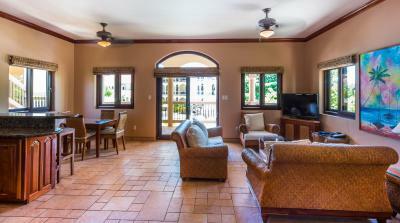 This bungalow features a tile/marble floor, cable TV and air conditioning. 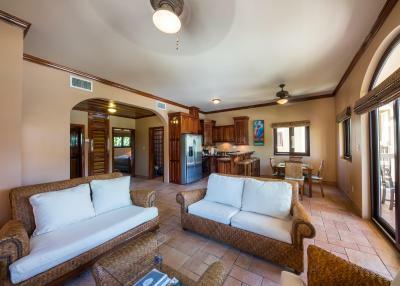 This large villa features high vaulted ceilings, as well as a large and comfortable seating and dining area. 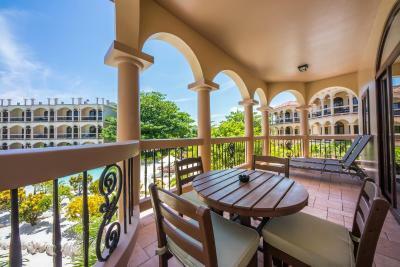 It has a fully equipped kitchen, private terrace, and a flat-screen TV. The bathrooms include free toiletries. This spacious, air-conditioned suite comes with a terrace which is Sea Front, as well as a comfortable seating and dining area. Guests will also find a fully equipped kitchen and a flat-screen TV with cable channels. 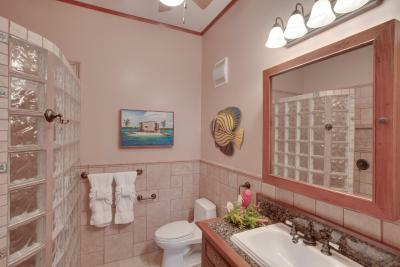 The bathroom offers free toiletries, and Wi-Fi is available throughout. 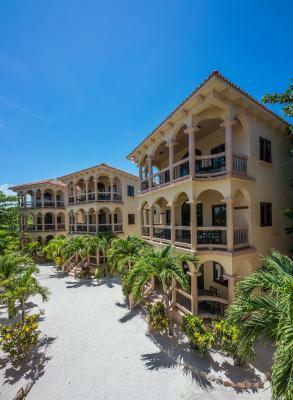 Located 3.5 miles north of San Pedro Town on the Tropical island of Ambergris Caye, this luxury resort offers the utmost in waterfront relaxation, romance, and adventure in Belize. 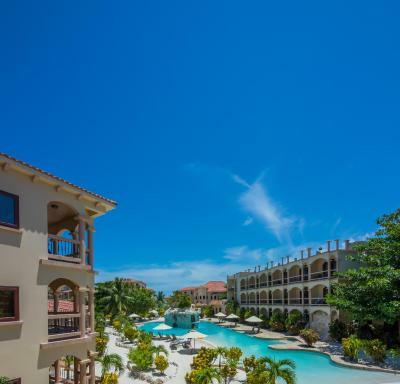 Outdoor pool, spa tub: Relax poolside at the resort’s amazing free form swimming pools, sidle up to the island’s favorite swim up bar, luxuriate with an in-room spa treatment, or take advantage of complimentary kayaks and paddles boards. 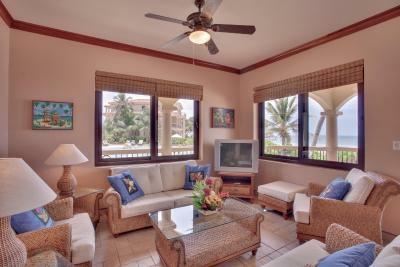 Complimentary WiFi hotspots are located throughout the property. 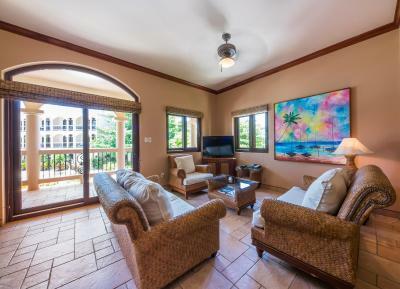 All rooms feature air conditioning, ceiling fans, a balcony or patio, cable TV, coffeemakers, mini-fridges, and microwaves. 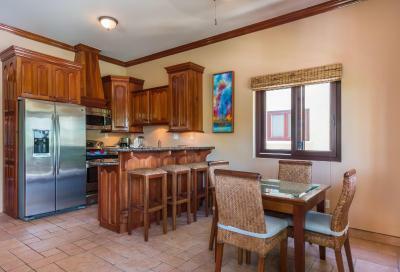 House/casita and villa units offer full kitchen facilities for added self-catering convenience. 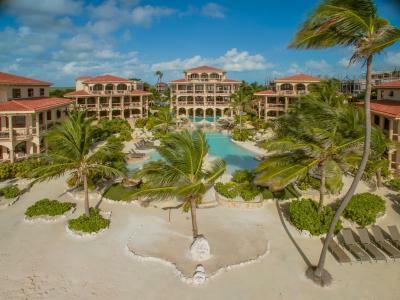 House Rules Coco Beach Resort takes special requests – add in the next step! Coco Beach Resort accepts these cards and reserves the right to temporarily hold an amount prior to arrival. Please note that once you land in San Pedro, Ambergris Caye, a representative will meet you and will assist you to get on the next available transfer. There is a surcharge of US$10 per person for one way. Transportation from San Pedro Town to Coco Beach Resort, arrival and departure transfers leave once per hour. Please inform Coco Beach Resort of your expected arrival time in advance. You can use the Special Requests box when booking, or contact the property directly using the contact details in your confirmation. The beach is not very nice because of all the seaweed that washes up on the shore. 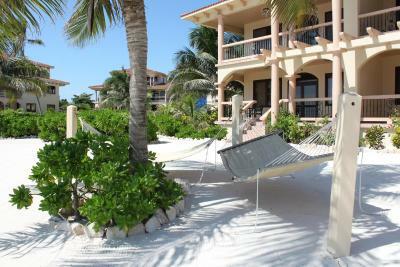 However, this is true of all of the resorts on Ambergris Caye. Cart rental from F and S Carts was great as they refueled the cart and washed the cart while parked at the resort however there was nowhere to lock belongings in the carts. Front Desk staff were extremely helpful. All staff were courteous and always centred on customer service. The food on site was expensive. We ate off site most of the trip. Hard to say, but the bar/dinner menu could be improved. We would have dined here more had they had a more interesting selection. Their breakfast cafe was lovely though.The beach was clean but all beaches along the strip are not swim friendly. If your not in front of a hotel the beaches are filthy full of garbage. 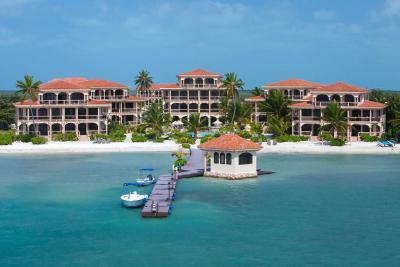 What a shame that Belize governmant does not take better care of this gem. We would not return to Belize due to the garbage and lack of effort from the local goverment to cleanup. The only downside is you can’t swim at the beach. Though the staff works tirelessly to clean up the sea grass, the beach isn’t ideal for kids and swimming. Luckily secret beach is a short 20 min ride away and well worth the trip. The pool was the most amazing thing. 4 different temperatures, swim up bar with food! Separate pool with giant rock structure with water slide to jump and play on. Did not like the beach. A lot of seaweed drifted to the shore everyday. Staff cleaned up daily at the resort but it wasn’t done throughout the neighborhood. The bed in Casita 1 was not comfortable. Other guests also had the same experience. Seagrass is becoming an issue on Ambergris Caye. Coco Beach does an excellent job in sweeping the seagrass from their beach every morning. There could be more than one or two paddle boards available for small groups. But I'm still not complaining. We adjusted with a kayak at the same time. Good location - far enough fro the bustle of San Pedro but central to sunset locations (The Truck Stop is our favorite) and dinners out. The concierge was very helpful with reservations for snorkeling fishing and restaurants. I don't have anything that I did not like. Such beautiful grounds. Amazing pool. Great villas with comfortable bedding and full kitchen. Loved the location! About 20 minutes to San Pedro and about 20 minutes to secret beach via golf cart.